Happy Friday! I hope you continue to find my Blog useful… and that your portfolio is still performing well during 2017. After experiencing a buoyant start to the year, I am pleased my investments have generally held on to their value during the last few months. All in all, the recent news from my portfolio has not been too bad, with a few minor share-price gains helping my performance improve to 9.5% for the year so far. …because this quarter has been the first since I started this Blog during which I have not bought or sold any shares. One reason for the lack of activity is that a lot of my time of late has been absorbed by matters outside of investing. I’ve just about managed to keep on top of my existing holdings, and simply not had the chance to study other companies and publish fresh watch-list reviews. Furthermore, current market valuations — especially those applied to higher-quality companies or those exhibiting superior growth potential — do not seem conducive to much buying at present. Plus, I am becoming quite comfortable with how my portfolio is evolving. You see, some of my past share-trading has involved ditching ‘deep value’ dreadfuls, and currently my holdings almost all exhibit a rich mix of high insider ownership, appealing track records, attractive financials and respectable prospects. As such, there really has to be a striking opportunity for me to trim down an existing position in order to purchase a new holding. I publish quarterly updates to round-up what has happened within my portfolio, and this Blog post outlines my April/May/June activity (or in this case, lack of activity). You can read all of my previous round-ups here. The left-hand column is how I reported my portfolio at the end of 2016, the middle column shows the Q1 position while the right-hand column is how my portfolio stood at today’s close. As usual I have kept watch on all of my existing holdings — trying to seek out bargain buys just in case. * Decent figures from Andrews Sykes, Mountview Estates and System1. * Acceptable progress at Castings, Record and S & U. * Unremarkable or mixed news from Getech and World Career Networks. * Nothing from Bioventix, City of London Investment, Daejan, FW Thorpe, M Winkworth, Mincon, Tasty and Tristel. The only other Q2 development I can add is my attendance at Tasty’s AGM. Meanwhile, I plan to attend Tristel’s Open Day on 19th July. With no trading or watch-list activity during the quarter, I have decided to use this update to evaluate my holdings on a particular investing theme. I have always found these types of evaluations to be quite helpful, as they can underline to me the most — and least! — appealing companies within my portfolio. For this study I will be concentrating on loyalty and commitment (through a sizeable ordinary shareholding). I will endeavour to look at management capability and track records in a future Blog post. iii) both a long executive history and significant shareholding (e.g. Record). 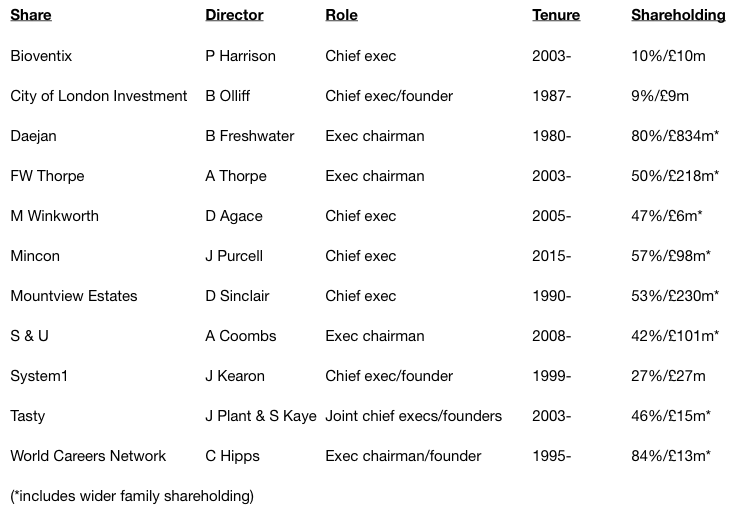 I would like to think these chairmen would look to protect their investments (and mine) by appointing a fresh chief exec should the need ever arise. So far at least, none of these ‘salarymen’ chief execs has let me down too badly. There’s not even a major shareholder on the board, either. Getech’s founder still holds 10% but he left the company a few years ago. As I say, I will endeavour to look at management capability and track records in a future Blog post. Disclosure: Maynard owns shares in Andrews Sykes, Bioventix, Castings, City of London Investment, Daejan, Getech, Mincon, Mountview Estates, Record, S&U, System1, Tasty, FW Thorpe, Tristel, M Winkworth and World Careers Network. This entry was posted in My Portfolio on June 30, 2017 by Maynard Paton. You really had great post! This serves an inspiration as we can learn from it. Your strategies and the portfolios that you have can provide us somehow an idea on what to do with our investments. Sorry if that’s what you think. :) I sincerely appreciate this post as I’m currently having queries as a newbie for investing and at the same time reading successful investing stories for insights and I was lucky that your blog was listed as well. Thanks! Ok, sorry about that. I am glad you find my Blog useful. Your article prompted me to run a similar exercise on my own portfolio. I didn’t realise how on board I was with the motivated founder/owner theory. Over half of my holdings meet the criteria. The levels of ignorance towards company management among investors is mindboggling. You wouldn’t employ someone to run a business in real life without vetting them thoroughly first. If you’re buying a chunk of a company for the long-term a similar set of standards should be applied where possible. Hopefully you’ve helped a few people learn that today! I also just stumbled across your Tasty AGM notes and was glad to hear the management team offered to meet with you. I’d love to get a more detailed breakdown of the problems facing the company and a phone call would probably be the best way to do that. Asking the crowd for menu choices is a little disconcerting — I hope this was very tongue in cheek! I think management is overlooked by many investors because it is hard to evaluate in a mathematical way. But the people in charge can make all of the difference, and a lot of the ‘moats’ we see today were in fact dug out by individuals some time ago. I guess the task for us is to identify the ‘moat-diggers’ well before the moat is so wide it becomes obvious to everyone.